By the the English Civil War in 1642 arms manufacture in Birmingham had become a staple trade concentrated in an area known as the “Gun Quarter”. Henry VIII had brought in master craftsmen from across Europe to develop the technology in producing everything from swords and armour to bronze cannon and shells; the industry became so important that in April, 1643 Prince Rupert sacked and burned part of the town to stop the flow of weapons to the Parliamentary forces. But by the reign of William III in 1689 most of the arms coming out of Birmingham were being exported, and the British Army was actually equipped with Dutch weapons. The Crown was not pleased with this arrangement, and Sir Richard Newdegate -a member of Parliament for Warwickshire- secured a trial contract with five of the leading gunsmiths in Birmingham to supply 200 Snaphance muskets every month “at seventeen shillings per piece ready money”. This contract continued for 150 years, and enormous quantities of firearms were supplied not only to the British Government but also to foreign armies: by the end of the Napoleonic Wars it is estimated that some 7,000 people were employed to produce 525,000 weapons a year. 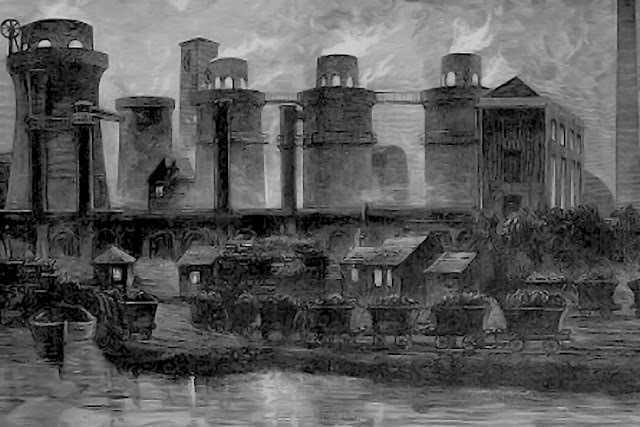 Starting with an initial capital of £24,500, the new company purchased a property at Small Heath and began construction on a factory; by the end of 1863 preliminary work was begun on their first large order -20,000 Enfield rifles for the Turkish Government- and in 1866 the BSA received its first British Government contract to convert a number of outdated muzzle-loaders into breech loading weapons. Combined with large contracts from foreign countries, BSA was quickly becoming the largest private arms company in Europe. At the outbreak of the Franco-Prussian war in 1870 the government, nervous at the possibility of becoming involved, placed a large request for Snider rifles: unfortunately BSA had recently adapted all their machinery to fulfill a Russian contract. Nonetheless, it hurriedly re-adapted all the machinery at Small Heath and after delivery of the first 20,000 contracted rifles the War Office intimated that the company could expect contracts for another 48,000 within the next year. But with the collapse of France and the signing of peace in May, 1871 the crisis was over and the orders never materialized. Instead it was decided to equip the British Army with the new Martini-Henry, and the company was asked to start manufacturing the necessary tools and gauges. BSA was informed that there would be no further orders for Sniders, but as compensation an extra payment of five shillings each would be paid on the final contract for 20,000 rifles. It was profit, but it was not enough work to keep the factory running. Around the same time Turkey announced that it was accepting applications in trials of various rifle models with the ultimate intention of purchasing 200,000 pieces on contract. Armament firms around Europe and America rushed to send representatives to Constantinople, and BSA dispatched two officials from London. 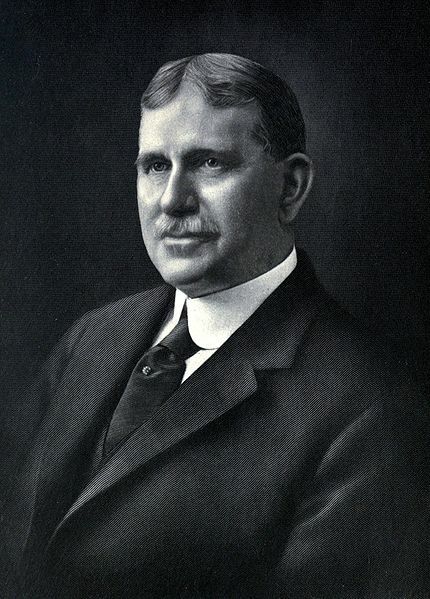 But the rifle they intended to enter in the trials failed to arrive in time and the order went elsewhere; later it was discovered that the company’s agent was also acting for firms in the United States, and had deliberately held back BSA’s entry in the hope that the order would go to one of the American companies which had offered a larger commission. It was a hard blow to the company, already facing the loss of their domestic contracts. But by 1880 orders for rifles and ammunition had fallen to the point that they were not sufficient to keep the plant and staff fully employed, and BSA turned its attention to cycle manufacture. Still, manufacture continued for two years and the Otto was joined by the “Alpha Ordinary Bicycle” along with “Beta” and “Delta” model tricycles. 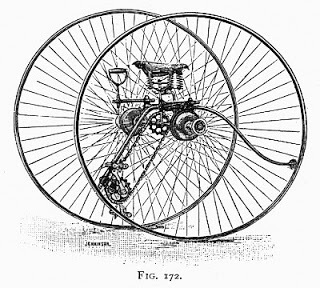 In 1881 BSA began manufacturing rear-driven tricycles for other companies. 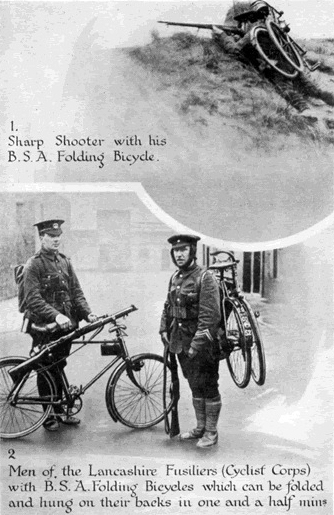 The output of BSA bicycles and tricycles steadily increased up to 1887, when the government began re-equipping the British Army with new Lee-Metford magazine loading rifles and placed an order for 1,200 rifles per week. For the next six years focus was back on the arms business, and bicycle parts were limited to the minor production of axle bearings. 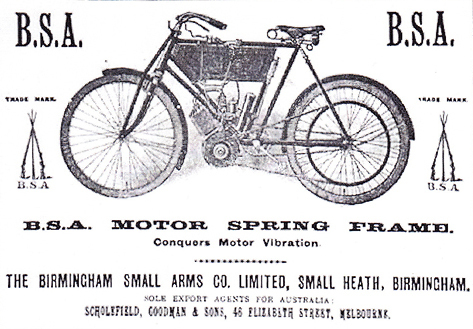 In early 1893 arms demand declined again and BSA reincarnated their bicycle parts line with a series of hubs exhibited at the Crystal Palace show, following up with various cranks, steering heads and other fittings. In 1896 the Small Heath Works were expanded to enable the company to better deal with the rapidly growing demand for BSA cycle components, which were developing a promising reputation. After the ammunitions plant was sold to the Nobel-Dynamite Trust Ltd., a new factory was opened to specialize in bicycle chains. The company soon added lines of frames, handlebars and brakes to their parts catalog, and began investing in new facilities for the specialized production of these components. A new malleable iron foundry and a facility dedicated to ball bearing manufacture were also constructed. An important aspect of these fittings was that they were all standardized, and BSA produced their own tools and spanners: this would be a determining factor in the company’s future. On the race track BSA bicycles were beginning to score success: Tom Peck set a record with a BSA as the first cyclist to ride from Land’s End to John o’ Groat’s (8371 miles) under three days. More extraordinary rides were accomplished by C. Moss, including three consecutive Bath Road 100 Miles Cups for fastest time, on the third occasion pulling in under 5 hours. 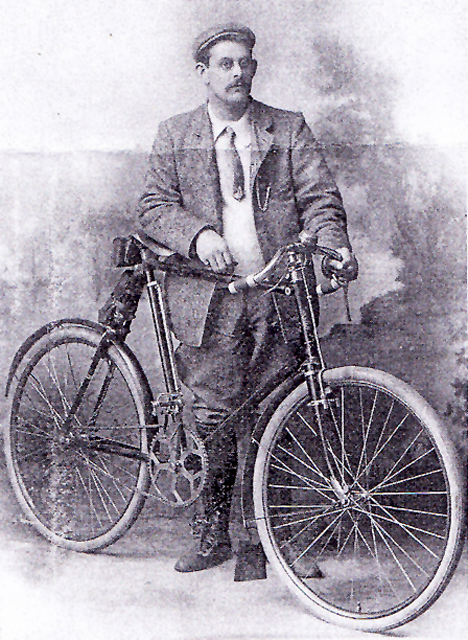 In 1902 the War Office adopted BSA fittings for military bicycles. As the interest in motorized bicycles began to heat up in 1902, BSA started marketing special fittings and frames for use with low power engines. In 1903 the company built their first motorcycle prototype using a BSA pattern frame fitted with a Minerva 233 cc engine, similar to the contemporary Triumphs. But the company was still committed to designing components rather than complete machines: in 1905 they introduced the Spring Frame for “clip on” inclined engines from 2 to 4 hp. and began supplying sets of specialized fittings for vertical engines up to 3 ½ hp. These kits were supplied to the established trade: BSA themselves tested an engine of their own manufacture in 1904 but it was never produced due to the economic situation. In 1906 BSA took over the former National Arms and Ammunition Company in Sparkbrook, Birmingham and a year later the Eadie Manufacturing Company in Redditch, another fitting manufacturer almost as famous as themselves. 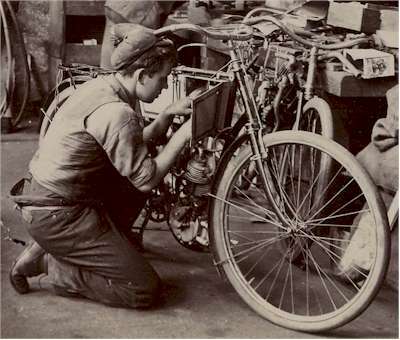 They established a motor-car department in the Sparkbrook factory, (leasing part of the facility to the Lanchester Motor Company) and the first prototype automobile was produced in 1907 under BSA Cycles Ltd. Finally, in 1908 the first complete BSA bicycle in 21 years was released to the public. 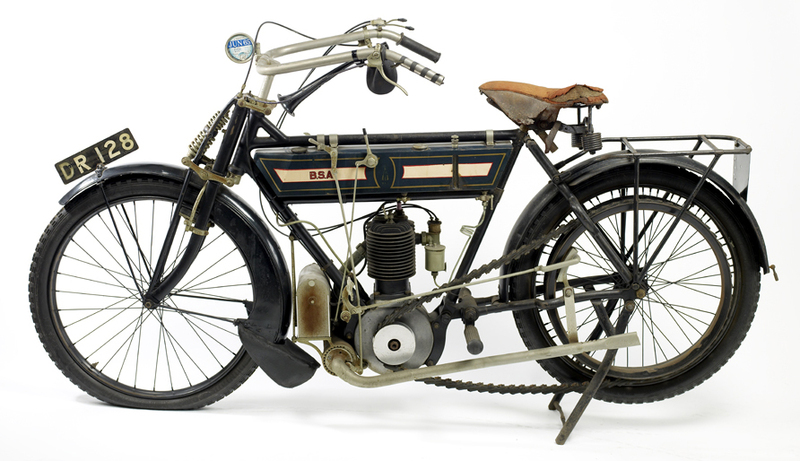 It was followed by the first true BSA motorcycle in 1909, a sturdy 31/2 hp. belt drive machine with a motor that bore more than a passing resemblance to the Triumph engine of the period. These machines sold for £50 and were described as being “by no means a potterer“, featuring a double sprung fork and optional patent cone clutch in the rear wheel. This machine had been under development for at least 5 years, so it is not surprising that it was “right” from the start. Motorcycle development continued with other models joining the range, including the three speed chain/belt model “K” and the all chain model “H”, as well as sidecar combinations. On the small arms front, B.S.A. had been gradually developing a line of of sporting rifles since 1890 which had garnered a reputation in the hands of big-game hunters. The Boer War brought a heightened interest in the domestic “sport and practice of rifle shooting”, and by 1902 there was a notable increase in the number of rifle clubs in Great Britain. B.S.A. quickly developed a line of .22 caliber sporting rifles based on military designs. They were also producing Lee-Enfields in various configurations and a new, highly popular line of air rifles. In 1911 US Army Colonel Isaac Newton Lewis designed a multipurpose light machine gun with a top-mounted magazine, capable of firing up to 600 rounds/min. The gas operated weapon weighed in at a mere 28 pounds and had an effective range of almost 900 yards, making it highly suitable for mounting on fighter aircraft which were being developed at the time. Frustrated by political differences with the Chief of the Ordnance Department for the US Army, Lewis had retired and moved to Belgium where he established the Armes Automatique Lewis Company in Liege to facilitate commercial production. In 1913 he began working with BSA to overcome some of the production difficulties, and in 1914 BSA purchased a license to manufacture the Lewis Machine Gun in the .303 British caliber. British Mark IV tanks soon replaced the older Vickers and Hotchkiss guns with the Lewis, but the open bolt firing cycle prevented it from being synchronized to the propeller arc of single engine fighters. Only the British Airco D.H.2 and Royal Aircraft Factory F.E.8 could readily use the Lewis early in World War I, mounted on Scarff Rings for observers or rear gunners. On later French Nieuports, British S.E.5a and some versions of the Sopwith Camel the Lewis was fitted above the top wing on a Foster mount which allowed firing directly forward above the propeller arc. Some 145,000 Lewis Guns were produced by BSA during the conflict. 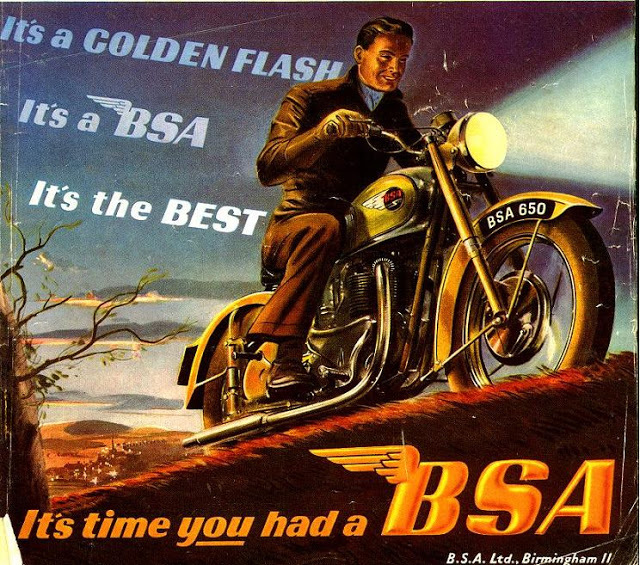 With this enormous acceleration of production -and realizing that the conflict would long and difficult- BSA immediately began a massive increase in factory extensions. Three four story blocks rose at the end of Armoury Road, 60 foot wide shops covering two miles and equipped with the latest machinery. Immediately upon the formation of the Ministry of Munitions in July, 1915 the company was declared a government controlled establishment, and every department was adding its quota to the wide range of munitions being supplied to the British and Allied Governments. In addition to the large quantities of arms required for the military there was a constant demand for bicycles and motorcycles for both the British and Allied Governments. A special type of folding military bicycle was designed, along with special machine tools, jigs, gauges, aero components, gun locks, shells and fuses. 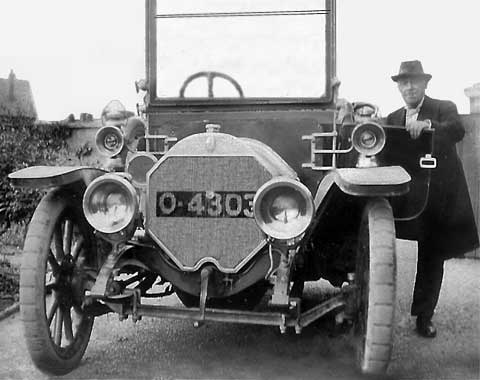 Daimler supplied a huge percentage of staff cars, ambulances and commercial vehicles, including the engine and transmission of the worlds’ first tank. By 1916 the BSA/Daimler Group factories were employing nearly 20,000 people compared with the pre-war total of 6,500 employees. After the Armistice it was decided to separate the company into three main divisions under separate management: BSA Cycles Ltd. to handle bicycle and motorcycle production at Small Heath and Redditch; BSA Guns Ltd. to continue small arms work at Small Heath, and BSA Tools Ltd. to develop the business in tools, jigs and special purpose machines at the Sparkbrook factory. At face value this post war configuration appeared stable, but the bright hopes of 1919 were soon shattered: two years later only half of the BSA labor force was still at work. Still, there were encouraging signs. 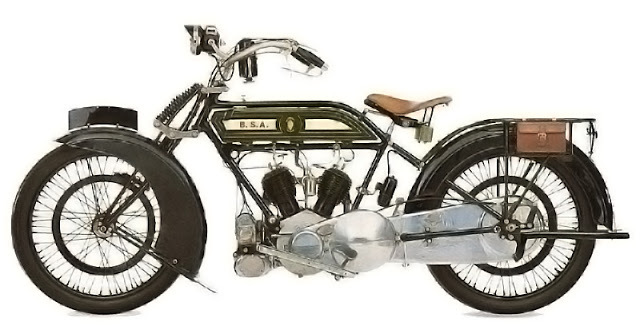 In November 1919 BSA launched their first 50 degree v-twin Model E, 770cc side valve (6-7 hp) motorcycle for the 1920 season. The bike had interchangeable valves and a total loss oil system with both a mechanical pump and an manual emergency pump. Other features included an Amac carburetor, chain drive, choice of magneto or Magdyno, a 7-plate clutch, 3 speed gear box with kickstarter and a new cantilevered fork. Retail price was £130. BSA’s motorcycle range was proving so popular that they adopted the advertising slogan “One in four is a BSA“, and in fact BSA made more motorcycles than the rest of the British motorcycle industry put together. Mass production methods were applied for the first time with the introduction of the 250cc “Round Tank” model B. In 1924 a quartet of BSA’s made motorcycling history by successfully climbing Snowdon, eclipsed two years later when a couple of enthusiasts began a world marathon tour, covering 20,000 land miles through 24 countries on an 18 month journey. More achievements were chalked up in the thirties: the “Slopers” gave way to the big single Blue Stars and Empire Stars, which made their mark in trials and club events. When renowned engineer Valentine Page left Triumph to join the company in the late thirties, he completely revamped the motorcycle lineup and gave the machines the distinctive shape that was to last for 25 years. BSA took the Maudes Trophy for the “most meritorious motorcycling performance” after a series of grueling tests on two standard machines. Another successful demonstration was the assembly of a complete motorcycle from spare parts bought all over the country, which reportedly started on the first kick and went on to complete a difficult course. But far too soon the clouds of war began gathering again. This time BSA was much better prepared and had experience to draw on. After attending the Liepzig fair in 1935 two BSA executives reported that war was inevitable, and despite the lack of any government backing for 17 years the board courageously determined to immediately resume arms manufacture. When war was finally declared in 1939 BSA was the only factory already producing rifles in the UK (The Royal Ordnance Factories would not begin production until 1941), and their planning office and tool room had been on overtime for three years. By March 1939 BSA Guns Ltd. was producing .303 Browning machine guns for the Air Ministry at the rate of 600 guns per week. The British armed forces had already chosen the 500 cc side-valve BSA M20 motorcycle as their preferred machine, and the government not only requisitioned the 690 machines BSA had in stock but placed an order for another 8,000: additional orders came in from South Africa, Ireland, India, Sweden and Holland (see also SS Thistlegorm: the Red Sea BSAs). Motorcycle production was stepped up from 500 to 1,000 machines per week which meant a finished machine every 5 minutes: at the same time BSA staff were providing demonstrations on motorcycle riding and maintenance to 250,000 officers and men in all parts of the UK. 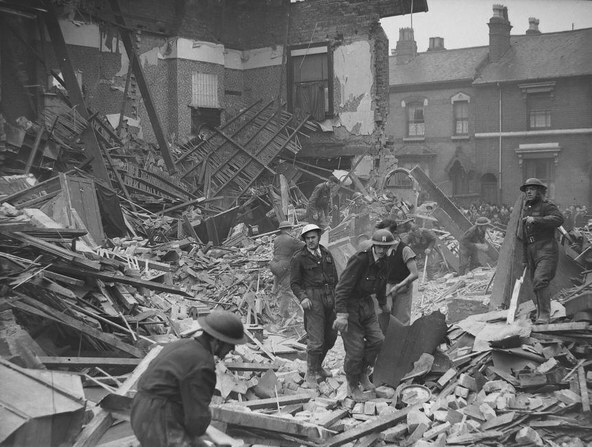 The factory at Small Heath was attacked by the Luftwaffe on 26 August 1940 with a H.E.bomb and a shower of incendiaries hitting the main barrel mill, causing the loss of 750 machine tools but fortunately no loss of life. Two more raids took place on November 19 and 22, 1940; the raid on the 19th did the most damage, causing loss of production and trapping hundreds of workers. Two night-shift electricians, Alf Stevens and Alf Goodwin, were awarded medals for their selfless acts of bravery in the rescue of their colleagues. 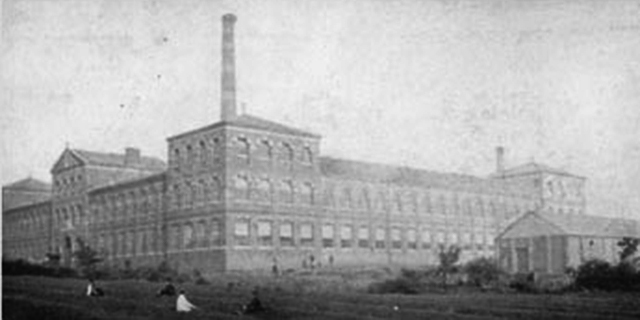 The raids killed 53 employees and injured 89, 30 of them seriously; they also destroyed machine shops in several buildings along with 1,600 machine tools, and halted rifle production for three months. In response both BSA and the Ministry of Supply immediately began dispersing production to other factories around Britain; facilities were set up in multiple locations to manufacture Browning machine guns, Ruislip produced the Oerlikon 20mm cannon, Stafford produced rocket projectiles and rifle production was moved to Shirley. At its peak Small Heath was operating 67 separate factories engaged in military production, and through the duration of the war the BSA Company was to produce more than 5,000,000,000 munitions components from 468,098 browning guns to 10,000,000 shell fuses, equal to 1,650 pieces every minute. Included in this total were 126,334 service motorcycles, almost all of which were M20’s. 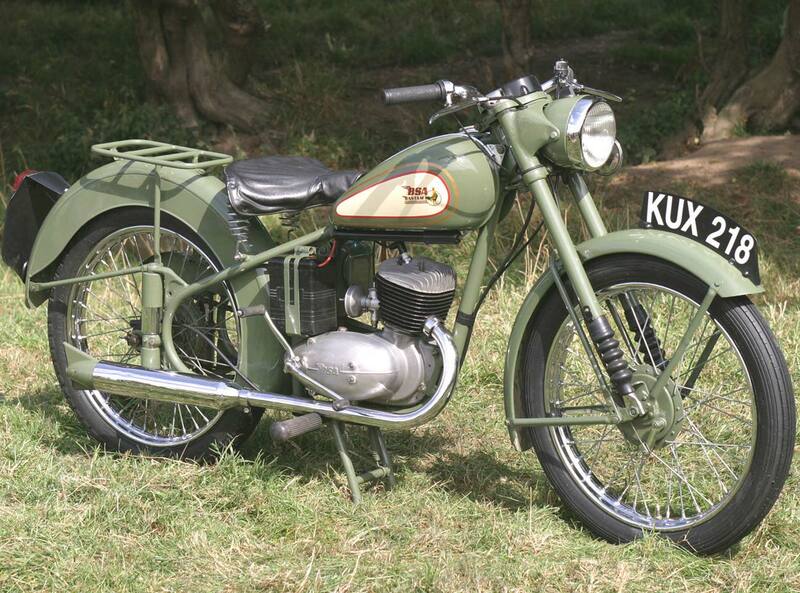 Like many other companies BSA got the DKW RT-125 plans in the War Reparations Act, which they converted to Imperial measurements and released as the Bantam D1 in 1948. It had telescopic forks, a rigid rear end and direct electrics, was available only in “mist green” and sold for £60 plus tax. Although the frame underwent several subsequent changes (beginning with conversion to plunger and then swingarm rear suspension) the single unit, bulletproof engine remained virtually unchanged for the full 23 years of production. 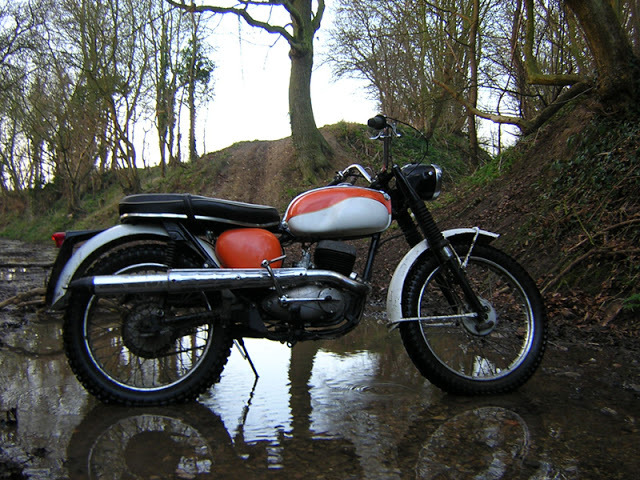 The Bantam was one of BSA’s most popular and recognizable models: the final version, an off-road “Bushman” was available as an export model for Australia and Africa up to 1994. 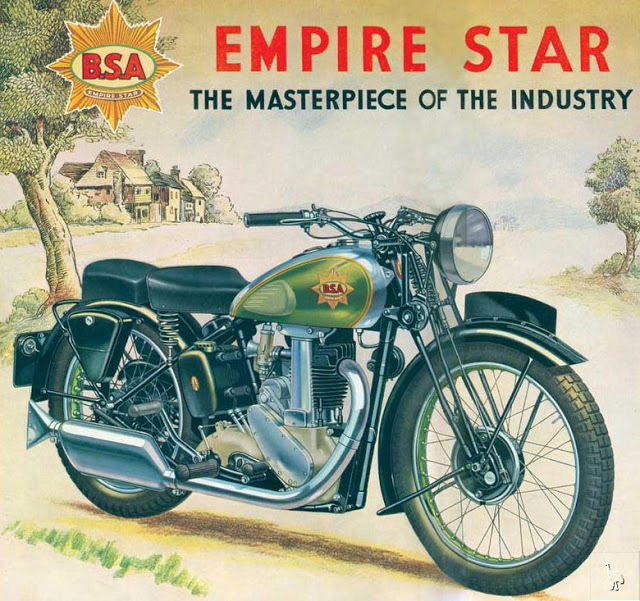 BSA was already a large company before the war, and they had purchased New Hudson Ltd. (1943), Sunbeam Ltd. (1943) and Ariel Motors Ltd. (1944) during the conflict. 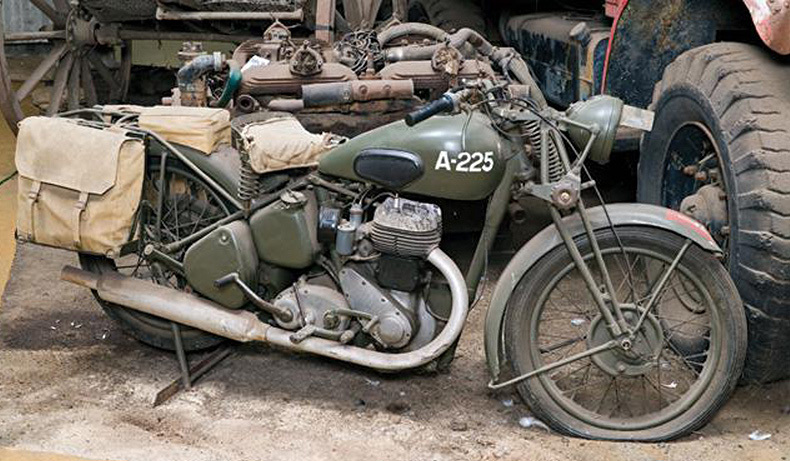 In the early post war years BSA Cycles enjoyed an unprecedented boom: a continent virtually without personal transportation for five years and still facing crippling fuel shortages was desperate for small, efficient vehicles. Small Heath was dedicated almost completely to motorcycle production and the company’s motorcycle interests were enlarged further still in 1951 by the purchase of Triumph Engineering Company Ltd. (see Triumph Engineering Co. Ltd.: British Speed): this made BSA unquestionably the largest producer of motorcycles in Western Europe. In 1953 BSA Motor Cycles Ltd. was created as a separate division from BSA Cycles Ltd., and the bicycle division was sold to Raleigh in 1957. Daimler was the only part of the group still struggling: their cars were considered luxury machines, and there was a marked decrease in wealthy customers after the war. Their saving line was in buses, which although small was quite successful: in May 1960 the Daimler business was purchased from BSA by Jaguar Cars. 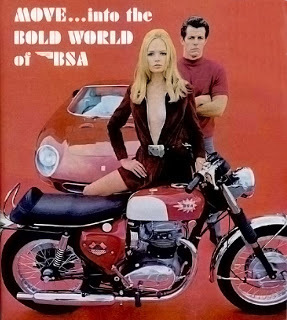 BSA was awarded the Queens Award to Industry in 1967 and 1968 for the export of BSA and Triumph motorcycles. 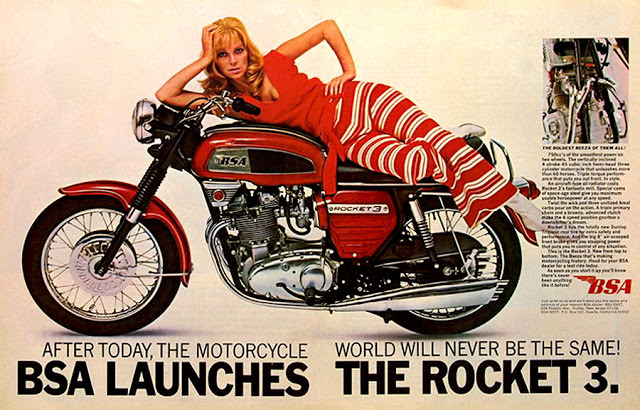 When the new three cylinder machines were launched (BSA Rocket 3 / Triumph Trident) in 1969 they accounted for 80% of the British motorcycle industries exports. But despite all this success, 1971 brought a major crisis to the whole group and they found themselves with a trading loss of £3 million. In fact, since 1960 trading had been declining at an alarming rate. In addition to these troubles there was sales resistance to some features of the motorcycles announced in November 1970. 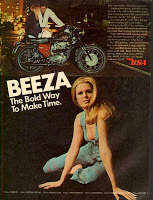 BSA had made some extraordinary blunders, probably the most disastrous being the Ariel 3. 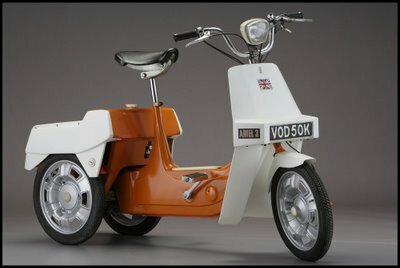 Launched with fanfare from the BSA management and round condemnation from the motorcycle press in the Spring of 1970, it was a three-wheeled moped with automatic transmission and a novel hinging system allowing the front to be leaned like a conventional two-wheeler while the rear, containing the engine & transmission unit, sat squarely on the road. The engine was a 50cc fan cooled single cylinder two-stroke made by the Dutch company Anker. 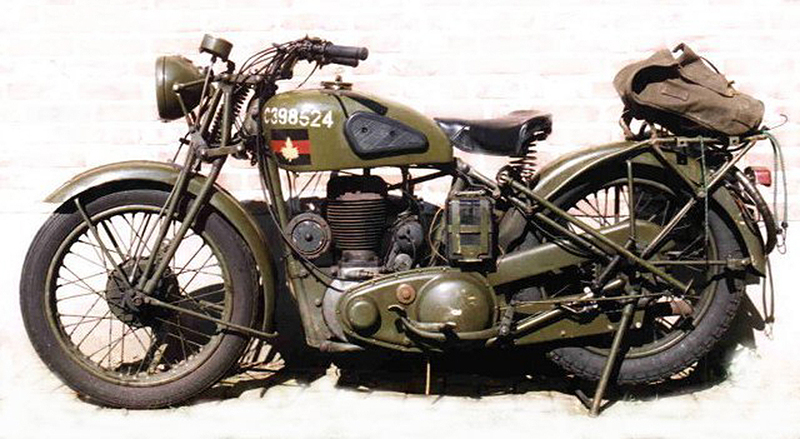 BSA had tooled up for a total production of 2,000 units a week but only a few hundred were sold, an exercise which cost them some £2 million. (Strangely enough, when compared to today’s motorized tricycles that are ubiquitous at any shopping mall the Ariel 3 could simply be considered ahead of its time.) Nonetheless, at the end of 1972 Barclays Bank provided £10 million in new financing and new CEO Brian Eustace rapidly set about reorganizing the company for a fight back to profitability. 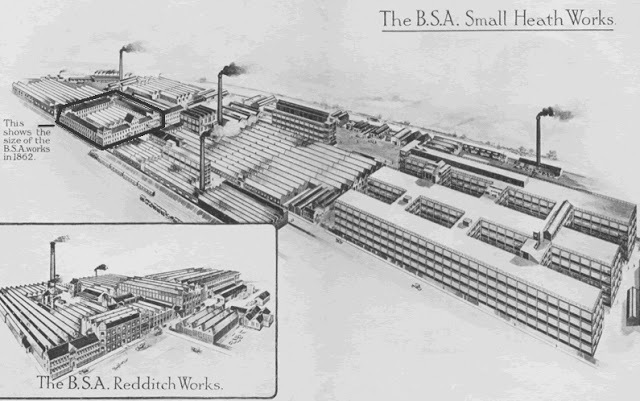 Both BSA and Triumph manufacturing was concentrated in the Meriden plant and Small Heath was being used for engine and component manufacture. “Trying to do too much in too short a time” well describes the frantic rescue attempt undertaken late in 1971, when no fewer than 13 new or much revised BSA and Triumph models were announced in a lavish gala in London. But the factory had numerous production problems and missed the market both at home and in America: towards the end of the year the group was on the verge of bankruptcy. Notwithstanding the bank’s £10 million support and the sale of various assets, a reconstructed board of directors were unable to prevent another multimillion pound loss. On top of this, competition from Japanese companies like Honda, Yamaha and Suzuki were rapidly eroding BSA’s market share. A merger with Norton Villers was started in late 1972, and for a brief time a Norton 500 single was built with the B50 based single cylinder engine but few if any were sold publicly. 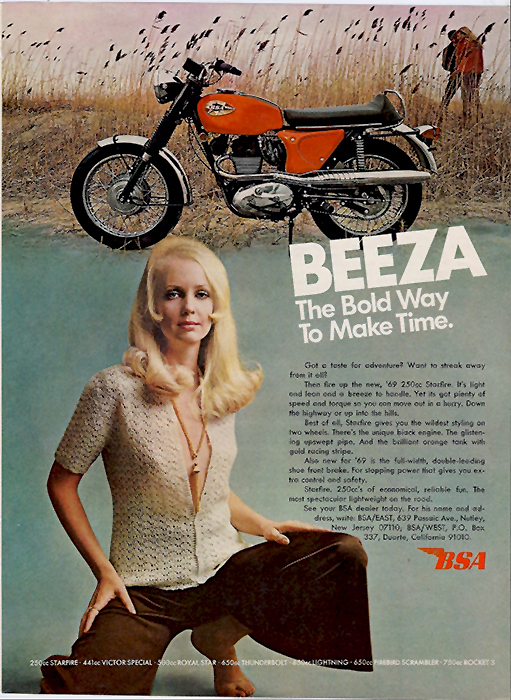 Although the BSA name was left out of the new company, some products continued to be made with the logo until 1973. The final lineup was four models: the “Gold Star” 500, the 650 “Thunderbolt” and “Lightning” models, and the 750 cc “Rocket Three”. A plan to rescue and combine Norton, BSA and Triumph fell through in the face of worker resistance though, and both the Norton and BSA factories were eventually shut down. Triumph staggered for a few more years before its final collapse in 1983. 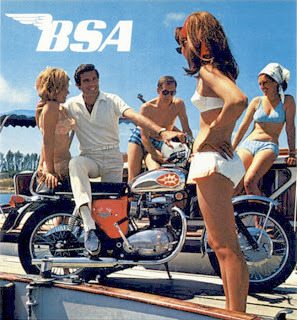 When Norton-Villiers-Triumph was liquidated in 1978 its management formed a new BSA Company and bought the rights to the BSA Motorcycle brand. This new company produced military motorcycles and some Yamaha powered offroad motorcycles under the BSA name for developing countries. The facilities moved from Small Heath to Coventry in 1973, then again in 1986 to Blockley in Gloustershire where production continued mostly for export to Africa. 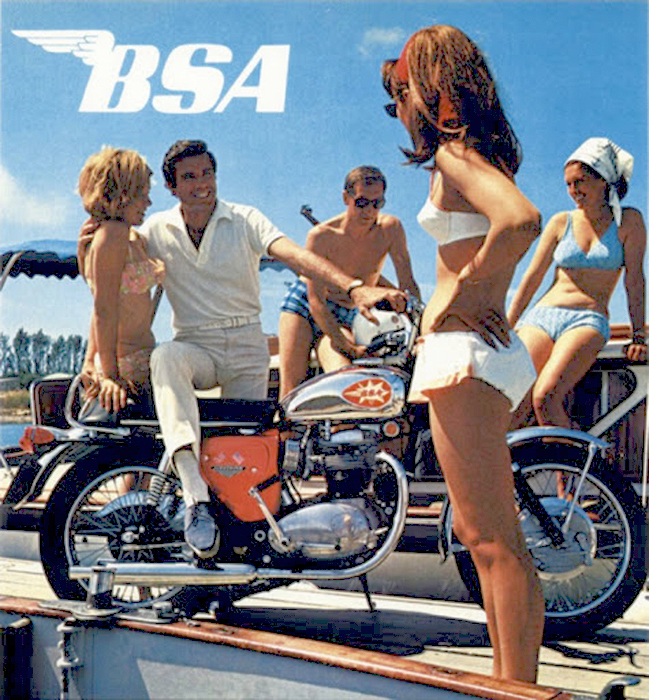 In 1991 BSA Company was merged with another buyout, Mike Jackson’s Andover Norton International Ltd., to form a new BSA Group. BSA purchased the spares business from Norton Motors and this prompted a rapid and continuing growth in the sale of genuine parts. MZ (GB) Ltd. was acquired (see History of Motorradwerk Zschopau: DKW, IFA and MZ Motorcycles), and BSA Group became heavily involved with the renowned Norton F1 designer Seymour Powell in developing and launching the MuZ Skorpion which later took the 1994 BBC Design Award. In December 1994 BSA Group was taken over by a newly formed BSA Regal Group and the company moved again, this time to Southampton. In 1997 production began on the hand built 400cc “Gold SR”, with the first batch of 200 machines exported to Japan. Production of the BSA “John McLaren”, a 50cc child’s Junior MX bike, also commenced in 1997 and small numbers continue to be built under license. The spares business continued to supply the world’s Norton twin owners and restorers. In 1999 a 500cc version of the Gold SR was launched for the European and American markets, but by 2003 it had become clear that demand was not reaching expectations and production was killed. The 1,000cc Tempest, widely acclaimed in its prototype form, never reached the production line and MZ sales failed to reach their promising potential. 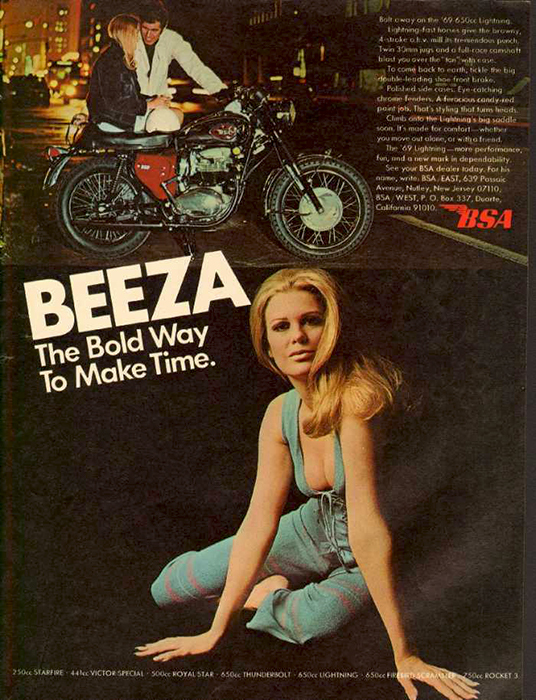 In 2007 BSA’s involvement with MZ ended with the sale of the parts business. 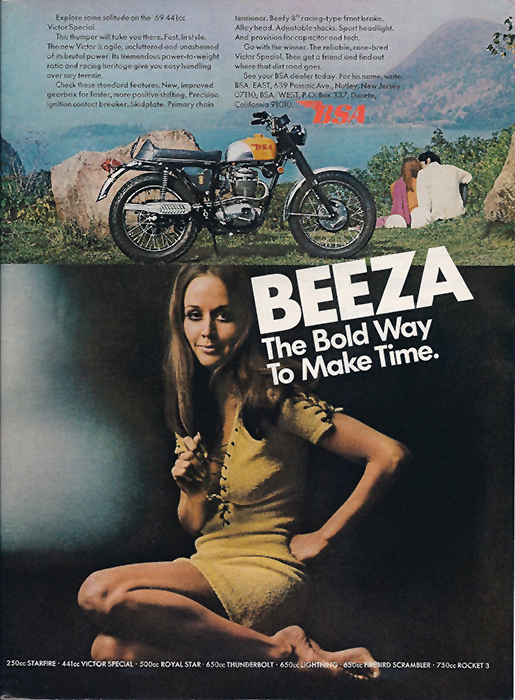 In the same year Joe Seifert, the new owner of Norton Motors Ltd, made a successful bid for the Norton Commando parts business, and this included the return of the European trademarks to BSA Company. Today the BSA Regal Group continues to use the famous winged logo, providing building and property maintenance along with some engineering services and manufacture of industrial equipment. Note: as a commenter below has pointed out, the BSA Company is also currently manufacturing optics including a line of rifle and pistol scopes. I don’t know the actual connections between this company and the original, but their website may be found at http://www.bsaoptics.com/. Lots of BSAs still available if you are willing to look….I sold my 1970 Thunderbolt only a couple of years back – I kind of miss it now of course!